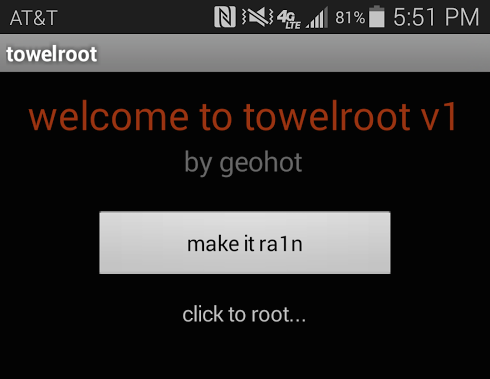 BREAKING: Geohot Roots the Verizon and AT&T Galaxy S5 (and Almost Everything Else) with Towelroot! If you’ve ever owned an iOS device or a Sony PlayStation 3, you’ve more than likely heard the name George Hotz. Otherwise known as XDA Recognized Developer geohot, this New Jersey-based hacker gained notoriety for his work in jailbreaking and otherwise hacking the aforementioned devices. Now, using a recently discovered Linux kernel vulnerability, geohot has managed to root the Verizon Samsung Galaxy S 5. The root exploit itself is built around Linux kernel CVE-2014-3153, which was recently discovered by hacker Pinkie Pie, and it involves an issue in the Futex subsystem that in turn allows for privilege escalation. Although expressly released for the Verizon Galaxy S5, the root exploit will realistically be compatible with practically every device with an unpatched kernel–which at this point should be nearly every device not running a recent nightly build of a custom ROM with a patched kernel. As such, it has also already been tested and found to work with the AT&T Galaxy S5, Nexus 5, Galaxy S4 Active, and AT&T and Verizon variants of the Note 3. If you’ve got a Verizon Galaxy S5 or any other previously unrooted device and you want to get in on the root action, head over to the original thread and give towelroot a try. And if you need some background music while you root your device, head over to Geohot’s SoundCloud to listen to a song released 10 days ago advertizing Towelroot.